I recently listened to someone explain why they felt no guilt about hacking Mario Kart so that they could cheat in it. “Morality holds progress back,” he said. Huntereb has been uploading proof of his various Nintendo hacks for the past year or so. His most notable hacks involved the 2011 3DS game Mario Kart 7. He’s hacked the successful Mario racer to give him an edge over people unfortunate enough to wind up in an online match against him. It’s one thing to manipulate how a game functions offline, but it’s much harder to carry those hacks online, where most game companies are able to detect and punish those who are trying to break the rules. The thing is, Nintendo’s not a company known for being Internet experts and he’s somehow been able to slip some of these hacks by. Huntereb described his feelings about online cheating as “pretty relaxed,” which is probably an understatement. Hacking is not inherently good or evil but a function of curiosity. What one does with their hacks defines who they are. Some hackers make changes in games to help other players, to be the hero. Others play the villain, hacking games for advantages regardless of who it pisses off. Huntereb is more from that side of things. His taste for hacking came from an Action Replay. Like GameSharks, these accessories allowed players to modify game code to unlock unlimited lives, hit points or whatever else you wanted in a game running on a Nintendo 64 or PlayStation 2 or the like. In other words, the Action Replay let you do things in games that you weren’t supposed to do. There is no Action Replay or GameShark equivalent in 2016. Console developers have largely stopped players from going under a game’s hood. (It’s a different story on PC.) Huntereb feels this has prevented people from understanding how software and hardware truly work, measures taken ostensibly to protect people, but often to obfuscate and remove control. 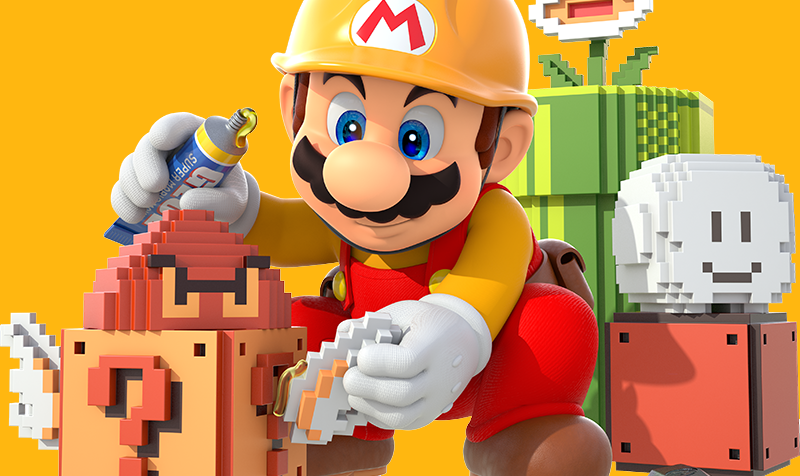 He’s been pushing that to the limit lately with Super Mario Maker, a game that’s gotten him in trouble with Nintendo. The company recently banned his Wii U from online play and deployed YouTube copyright takedowns to take his hacking videos removed from the service. He’s resorted to uploading videos with non-Mario music and flipping the video, hoping to avoid them. Huntereb’s hacking comes with one rule, though: no permanent consequences. He broke that rule with Mario Maker, and it’s gotten him into hot water. He used Mario Maker hacks and exploits to mess around with people’s levels online, allowing him to finish them in ways the designers never intended. He was able to achieve world record times in some of them, defeating the purpose of the world record marker that the game puts in a given shared level. That marker is supposed to measure genuine runs. You can quickly imagine how that might break a lot of levels. He started breaking records using the cheat, one after the other. People were pissed, obviously. Going overboard doesn’t mean he regrets his actions, however. MrBean35000vr, a hacker Kotaku interviewed in 2014 as part of a story on hacking Mario Kart 8, isn’t a huge fan of folks like Huntereb. MrBean35000vr might respect the work being put into understanding these games, but when it’s used to ruin people’s fun, that’s a line too far. MrBean35000vr and Chadderz have gone in the opposite direction. The two started out by hacking Mario Kart Wii, hoping to build new tracks to race on. It took six months of tinkering to craft their first track, but the response was huge, and they started building custom tools for others to use. Flash forward several years later and hundreds of fans have used the brothers’ hacks to create thousands of tracks for Mario Kart Wii, fruitfully extending the game’s life long after Nintendo had moved on. The brothers created their own track pack, CTGP Revolution, that contains stages built by themselves and others. The pack has 218 curated tracks, and people are still regularly playing them. MrBean35000vr closely watches those new to the scene, especially those he deems “destructive.” Any hacker, regardless of intent, has talent, and if it can be harnessed differently, it could benefit everyone. Some of these people have joined the brothers’ team. MrLuigi35000Vr—yes, that’s different than MrBean35000vr—was one of those people. MrLuigi35000Vr was in the midst of learning assembly code when he decided there was a more interesting application for his lessons: hacking Mario Kart Wii. He found ways to disrupt players online and force them to lose. We’re way more interested in messing around with the game rather than ruining the online fun. But also we’re interested in letting others participate in said fun. For a while, this amused MrLuigi35000Vr , but it didn’t last. MrLuigi35000Vr gained notoriety for being disruptive. He wanted to team up with other hackers, but his reputation in the community meant others wouldn’t take him. “I saw [others] use their knowledge to create something bigger and helpful,” he said. Eventually, he convinced some hackers to give him a shot, and he quickly converted to the other side. Now he collaborates with MrBean35000vr, Chadderz, and others in the community who want to know more about how Nintendo’s games work, not tear them down. Even when the group comes up with a new hack, they’ll debate over releasing it to the public. If it might do more harm than good, they’ll keep the information among themselves. “You could say that my passion and dedication to gain more and more knowledge, and to help the community grew thanks to them, their work, and the example they have given us,” he said.